And as suggested by previous Best Jobs in the World winner, Ben Southall, I’ve been doing as much research as possible about Australian animals. 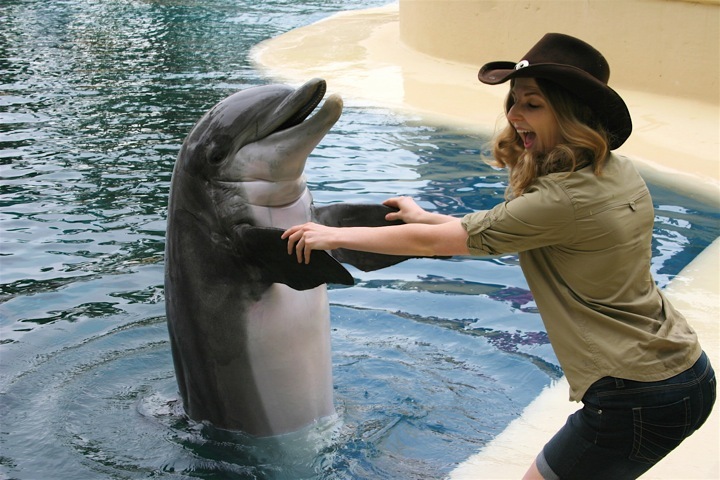 My new friend and fellow shortlister, Sarah Cross, invited me out to The Dolphin Habitat at The Mirage to learn a thing or two about her favorite flippered friends. I was incredibly excited about this because according to the Australian Department of Sustainability, Environment, Water, Population and Communities (SEWPaC), there are fourteen different species of dolphin found in Australian waters, including two types of Bottlenose dolphins. Sarah introduced me to her good friend, Cosmo, while she explained a bit about their pods. 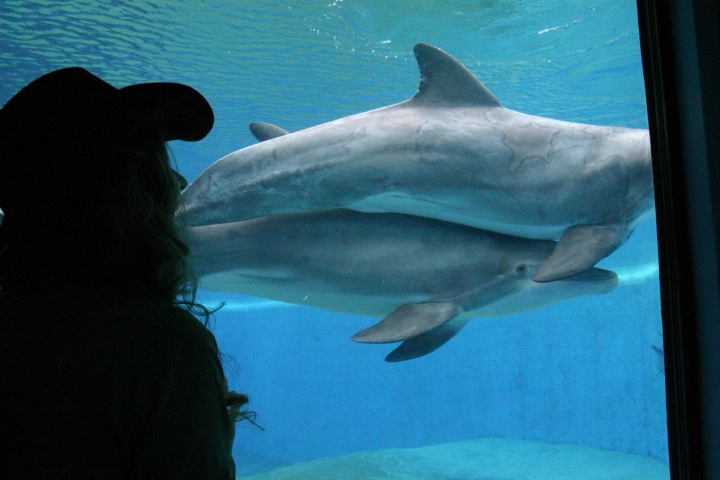 Dolphins typically only give birth to one calf every 2-3 years and they are born tail-first. Calves usually stay with their mothers for 3-6 years, learning all the valuable skills they need for survival. They are incredibly social creatures and will normally travel in groups of 2-20. But with that being said, scientists have recorded pods with up to several hundred members. The biggest predators for wild dolphins are actually humans. Water pollution, commercial fishing, and boat traffic all pose serious threats to their populations and quality of life. You can do your part to help protect the dolphins in the wild by keeping your local beaches clean. If you would like more information on The Marine Mammal Protection Act, click here. 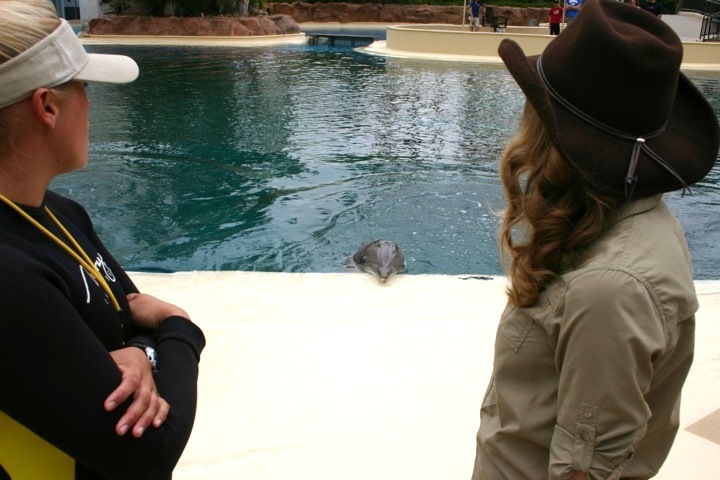 Many thanks to Sarah Cross and The Mirage Dolphin Habitat for assisting in my Park Ranger Training! Please support Sarah for ‘Wildlife Caretaker’ by following this link and ‘liking’ her Facebook page! Let’s get #TeamVegas all the way Down Under! Hilary Mirage Dolphin Habitat from Hilary Billings on Vimeo. This entry was posted in Australia and tagged animal encounters, Ben Southall, Best Jobs in the world, Biology, Bottlenose dolphin, Dolphin, dolphin pods, Marine mammal, Park Ranger, The Mirage Dolphin Habitat, tourism australia by Hilary Billings. Bookmark the permalink. ohhhh …super photo and blog !!!!! really !!!! Do you like dolphins? Do you have a favorite ocean animal? I’m a little late coming into the support crowd, but you totally rocked this girl! And posted my endorsement on the Aus Working Holiday Facebook page 🙂 get down under and find some dolphins – I did a “dolphin cruise” near Sydney once and didn’t see a single one! Wow, that would be disappointing! Was it a fun cruise regardless? Or do they give you your money back if you don’t see dolphins? Haha! Thanks for the info about staying 100 yards away for the dolphins’ protection. They are one of my fave animals, and I wasn’t aware of that. They are so rockin’ I would have tried to swim to them next time I’m in the ocean. Glad to know it’s better for them to be admired from a distance. I know! I wasn’t aware of that either! They always look so friendly when they’re out in the water, you’d think they’d just be ‘used’ to interacting with humans… Or so movies tell me so. I’m so thankful for Sarah’s knowledge and willingness to share with me! Let’s spread the word! Ditto! Let the word spreading ensue!